People have used fungi not only as a source of food, but also for medicinal purposes as far back as the Stone Age. Because mushrooms are both tasty and healthy - have a low calorie content, high levels of vegetable protein, contain chitin, iron, zinc, fiber, essential amino acids and a variety of vitamins and minerals. From the very beginning of our civilization, man has used mushrooms to produce fermented foods and medicines. In ancient Egypt, fermentation was considered a gift from the gods, just like in ancient Rome. Also, up to this day the Brazilian name for Agaricus blazei – Cogumelo de Deus, C. do Sol and C. da Vida, which is Portuguese for "mushroom of God, Sun and Life", respectively, shows high esteem for this mushroom. Also Asians have attributed curative properties from mushrooms; there are Chinese reports from around 500 BC, on the general medicinal and anti-cancer properties of Ganoderma lucidum (chin. : Reishi) extracts, which have been passed from generation to generation. Moreover, since the Ming dynasty, there have been reports on the medicinal properties of Lentinula edodes (shiitake) mushrooms, which were considered an elixir of life with the ability to cure colds. In the late twentieth century, researchers in Japan demonstrated the beneficial effects of a Brazilian mushroom, later identified as Agaricus blazei Murill, which quickly gained serious attention in the scientific world, especially because of its potential anticancer effects. Agaricus blazei Murill, as well as other medicinal mushrooms, have been studied intensively for about fifty years now. Since they contain substances that can stimulate the immune system (for example beta glucans) and fight off cancer, mushrooms have gained serious attention among scientists. 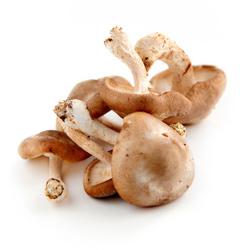 The beta-glucan content of Agaricus blazei is higher than in other studied mushrooms. Beta-glucans are quite diverse in size and structure and thus possess diverse immuno-modulating abilities. One of the pioneer studies was published by Ikegawa et al. in 1968 regarding the antitumor activity of mushrooms. Later on, Chihara et al. reported the purification of shiitake polysaccharides with high antitumor activity. One of these polysaccharides, lentinan, was commercialized for the treatment of stomach cancer and has been used in Japan for cancer treatment for the past 30 years (ref: Taguchi T 1983, see ref no 2 in Hetland et al, SJI review, 2008). Later, three other cytostatic drugs were isolated in Japan: krestin, produced by Coriolus versicolor mycelium and used in the treatment of cancers of the gastrointestinal tract, lung and breast; Schizophyllan, extracted from the culture medium of Schizophyllum commune and used in the treatment of cervical cancer, maitake D-fraction from Grifola frondosa tested generally as an antitumor agent in animal models. Also at the Memorial Sloan-Kettering Center, N.Y.C., a beta-glucan from this mushroom has been used in a clinical cancer trial (ref: earlier it was protocol 05-073, now on-going protocol 09-094, www.mskcc.org). Not only tradition but also scientific studies have currently accepted that certain edible mushrooms have serious pharmacological properties.